Recently, Microsoft Office 2010 beta was available for free download. If you have found the groove working through new Office 2010, how about adding spice with cool looking Microsoft Office 2010 templates. Microsoft has huge listing of free templates for Office 2010 for different category types. You can browse top and popular templates on the homepage or view full category listing to get specific type of template. 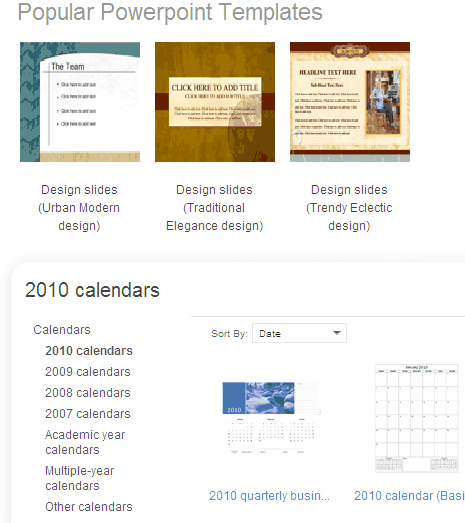 It also has exclusive listing of 2010 Calendar templates that allows you to make custom calendars within Office 2010. Checkout Office 2010 templates to add style to your documents and presentations! Open Docx files, how to?